Director/Writer: Bill Naud / Cast: Bari Suber, Rick Dean, Richard Helm, Red McVay, Jeanine Marie, Marie Alise, Terry Goodman, Ron Gardner, Jim Piper, Gary Phillips, Steven Tash. Don’t you love how the 18 sticker is over the W making it look like the film is called Hodunit? That would be one awesome flick. Is Whodunit? worse than dying? Would living in a world where Whodunit? didn’t exist be a bad thing? Hmm…well, who knows. We’ll all find out one day I guess. Maybe on my death bed as I recant all my wrongdoings I’ll be reminded of Whodunit? 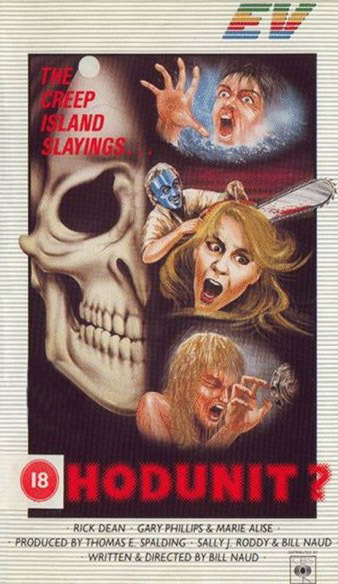 and it’s witty tagline (suited more to the alternate title Scared Alive) and that’ll finish me off. “Boil me, boil me, boil me, face to face…” and so on ad nauseum with ‘boil’ substituted for shoot, spear, burn, saw, chop and nail. Still sounds better than the Christmas X Factor singles though. With a candle. Ooooh, scary!! This tangles mess fills in some of its slack with long scenes of people meandering around an old dilapidated building in a bid to create tension – but the murders are quite gory and there are some half-neat one-liners. Without the ever-reoccurring annoyance of THAT song and some closure on why a totally anonymous and forgotten woman gets shot in the face at the beginning, this might’ve been good in an after-dinner cheeseboard sorta way. So, no, not WORSE than dying. But that song certainly is. tagged with gore o'clock, I want to die, slasher, slasher films that aren't supposed to be funny but are funny, the 80s, what the hell! ?